Welcome a new Mid-South Cross Country Season! The Top 20 Returners from a season ago. These places were based on the best available times from a season ago. South View's boys stayed up front in 1999, but will graduation and the opening of a new high school lead to the end of the Tiger Run? Will Nathan Adams' (E.E. Smith) return, after a season ending injury in 1999 result in another dominating performance? Can any young lady challenge Terry Sanford's Ashley Johnson? If so, will it be another Lady Bulldog? Speaking of the Bulldogs, can any women's team challenge their supremacy in the Mid-South? What about Douglas Byrd? Pine Forest? South View? And while on the topic of team titles, is South View's run over for its men's team? Or will they be able to overcome major losses to graduation and Jack Britt High School? Will Mazarick Park be ready and safe for the Fall schedule? What about the conference championship? * Nathan Adams was injured during the 1999 season and did not run. His rating has been determined by his 1998 performance. 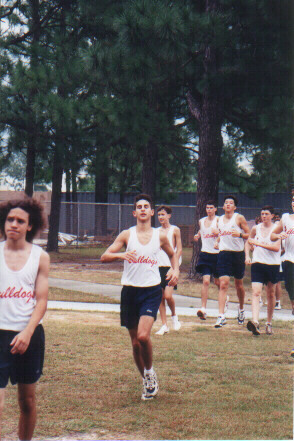 Terry Sanford's Ashley Johnson looks to make it three in a row in Fall 2000. The Bulldogs are looking to step up and contend in Fall 2k. South View's girls are expected to be an improved team in 2000.